Full-blown, hours-long musicals aren’t for everyone. For those with short attention spans or a tendency to fall asleep in dark spaces, musical theater can be a daunting evening out. That’s why the theater gods created cabaret, a less structured, more interactive way to bring musical numbers to the masses. As part of its Cabaret Series, the Lake Dillon Theatre Company presents “Broadway Then” in the fall and “Broadway Now” in the spring. The fall show highlights favorites from the Golden Age of Broadway, and the spring performance introduces the audience to new hits from the stages of New York. 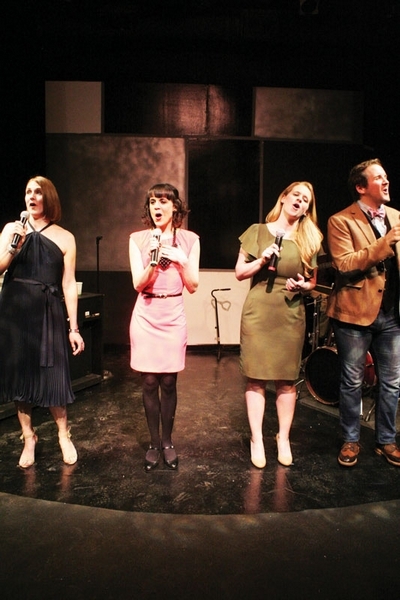 “Broadway Now” plays for one weekend only, today through Sunday, at the Lake Dillon Theatre. The first act of this year’s “Broadway Now” will feature tunes from musicals that are currently on Broadway, including “Phantom of the Opera,” “The Book of Mormon” and “Annie,” Grace said. The four-member cast – Grace, Renoux, Brittany Jeffery and Andrew Tebo, who holds down the fort as the single gentleman – sings in a cabaret style. Grace said it’s fun for the performers to choose their own repertoire and explain the songs and their meanings to the audience in their own words. Though the Lake Dillon Theatre Company’s full-scale, long run productions drive its calendar each year, the Cabaret Series also has its niche in the schedule.